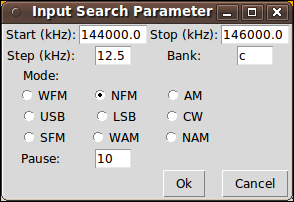 aor_search is a small widget designed to perform unattended explorations of the radio spectrum. users can provide "skiplists", i.e. list of known frequencies not to care about. The general idea was to have a software doing the boring job of sifting frequencies while I was at work. Coming back in the evening I'd then find a nice list of active frequencies I didn't know about. Logging alone would have already been interesting, but the availability of audio recordings really maximises utility of the tool. While there are some packages available doing the same thing, most of them are commercial and nothing seems available for Linux. (BTW I like arctl but I never managed to make it talk with the frequency db). Once Tcl/TK is installed you can download the software from here and extract it in your folder of choice. 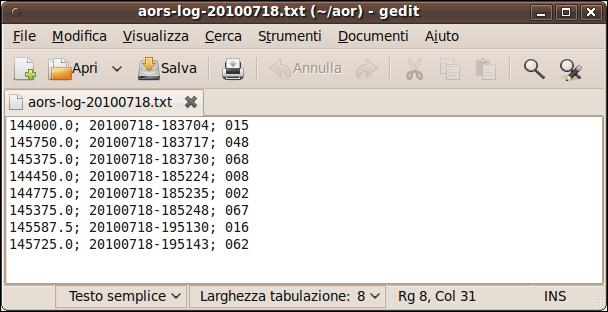 The AOR-like font for the display is included in the folder: under Linux simply double click on it to have it installed. Under Windows you may have to drag it into the fonts folder. Communications between pc and radio are preset at 19200 bps. There's no point in setting it faster, as the onboard controller is much slower in replying to commands. It's a good idea to launch software from the command line instead of double clicking on it, as some startup information is shown in the console that may help fixing problems. Alternative configuration files can be used specifying path and filename after the command line. In fact an alternative config file is provided in the folder for Windows. 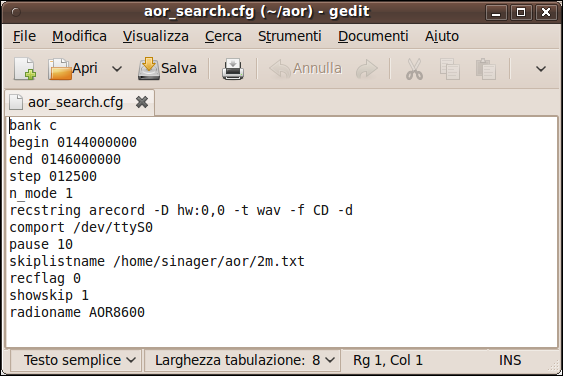 Should the software refuse to start due to problems in configuration, you can manually edit the aor_search.cfg file with a text editor. Audio recording is left to other utilities you can have available on your pc: a box under "options" will allow setting the command to fire it. Under Linux arecord works fine and several solutions are available under Windows. Unfortunately we've been unable so far to find a suitable non commercial software under Mac OSX (no, Sox didn't work reliably). work from the command line, with recording length and filename being specified as the last two parameters. Under Windows I found HDOGG works very well: please note that it must already be running when invoked from aor_search. "Bank" refers to the search bank the parameters will be written in, as the built-in search function is used in order to get maximum speed. Please note: chosen search bank will be overwritten by these settings! The "pause" value determines how long shall the scanner stay and record on a busy frequency. Maximum allowd by the radio is 60 seconds. Setting higher values or zero will cause malfunction in the software. This paramater will be written in search group 9 on the radio. Please note: search group 9 settings will be overwritten! "Skiplist" is where you can load you frequency database. You can have as many skiplists as you like saved on your pc, however only one at a time can be invoked: just compose them to suit your search. Putting frequencies in ascending order will make editing easier for you and software operation maybe slightly faster on big lists. If you didn't, shell command "sort" may do the trick. If you don't want to skip any frequency, just load the provided "skip0.txt" file. 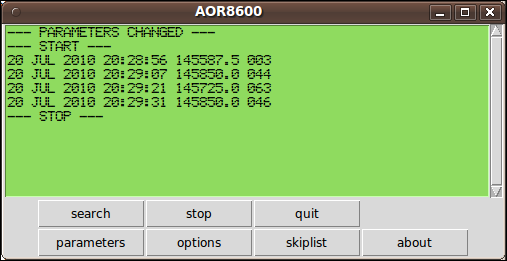 An example for the 2m band is provided within the compressed folder. RSSI (Relative Signal Strength Indicator): check radio user manual to get more info about the "LM" command reading. Please note that while pausing on an active frequency the "Stop" button will look unresponsive. It will in fact execute your command once the pause and recording are over. While testing it I already found a bunch of frequencies that escaped my searches in the past. This is it: I really enjoy my AR8600 and AR8200 and hope this widget will help you to enjoy them more if you like alternative operating systems. Suggestions, bug reports and thank you notes are greatly appreciated. My thanks to GiorgioFox and Funatic for pushing me in developing the software, providing ideas and testing. AOR_SEARCH is released under GNU/GPL v3 license.